Bipolar disorder is a mental condition in which a person has wide or extreme swings in their mood. Periods of feeling sad and depressed may alternate with periods of being very happy and active or being cross or irritable. Bipolar disorder affects men and women equally. It most often starts between ages 15 and 25. The exact cause is not known. 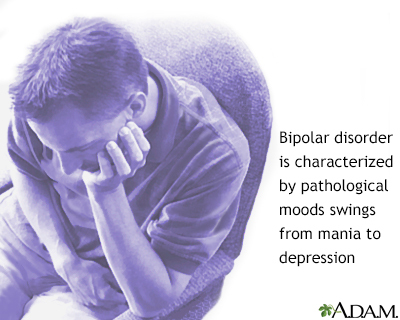 But it occurs more often in relatives of people with bipolar disorder. People with bipolar disorder are at high risk of suicide. They may use alcohol or other substances. This can make the bipolar symptoms worse and increase the risk of suicide. Depression and mania symptoms may occur together. This is called a mixed state. Symptoms may also occur right after each other. This is called rapid cycling. 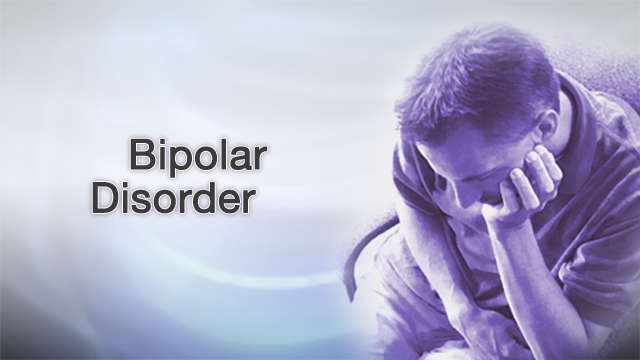 Medicines are a key part of treating bipolar disorder. Most often, the first medicines used are called mood stabilizers. They help you avoid mood swings and extreme changes in activity and energy levels. With medicines, you may begin to feel better. However, for some people, symptoms of mania may feel good. Or side effects from the medicines may occur. As a result, you may be tempted to stop taking your medicine or change the way you are taking them. But stopping your medicines or taking them in the wrong way can cause symptoms to come back or become much worse. DO NOT stop taking or change the dosages of your medicines. Talk with your provider first, if you have questions about your medicines. Ask family members or friends to help you take medicines the right way. This means taking the right dose at the right time. They can also help make sure that episodes of mania and depression are treated as soon as possible. If mood stabilizers do not help, your provider may suggest other medicines, such as antipsychotics or antidepressants. You will need regular visits with a psychiatrist to talk about your medicines and their possible side effects. Blood tests are often needed too. Electroconvulsive therapy (ECT) may be used to treat the manic or depressive phase if it does not respond to medicine. People who are in the middle of a severe manic or depressive episode may need to stay in a hospital until they are stable and their behavior is under control. Joining a support group may help you and your loved ones. Involving family members and caregivers in your treatment may help reduce the chance of symptoms returning. Talk therapy with a mental health provider may be helpful for people with bipolar disorder. Periods of depression or mania return in most people, even with treatment. People may also have issues with alcohol or drug use. They may also have problems with relationships, school, work, and finances. Suicide is a very real risk during both mania and depression. People with bipolar disorder who think or talk about suicide need emergency attention right away.